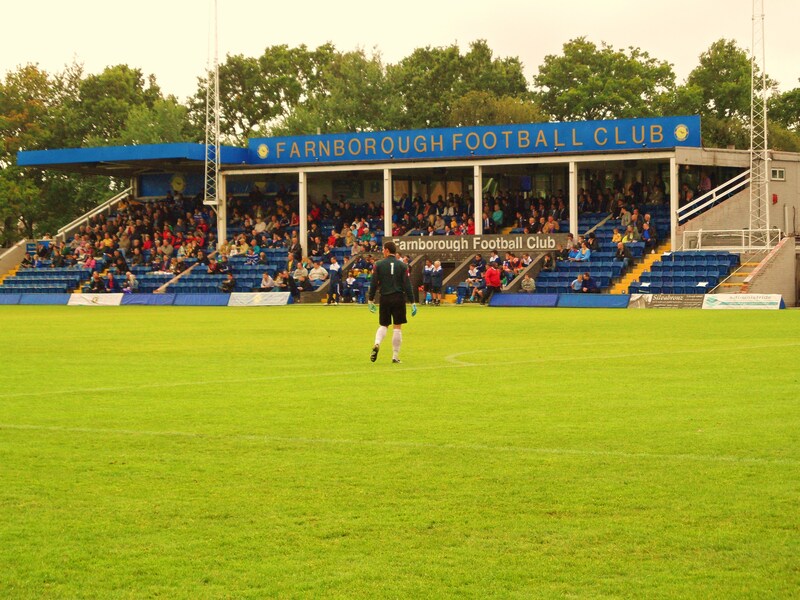 About the Rushmoor Stadium Farnborough FC are almost at the end of a long process that will see them with one of the best grounds at this level of non-league football. On one side of the ground is the Main Stand, named in 2009 the Charles Mortimore Stand after the long-serving club president. This stand comprises covered seating and was extended and improved during summer 2008. The total length of the stand is approximately half that of the pitch and on either side there are small terraced areas. 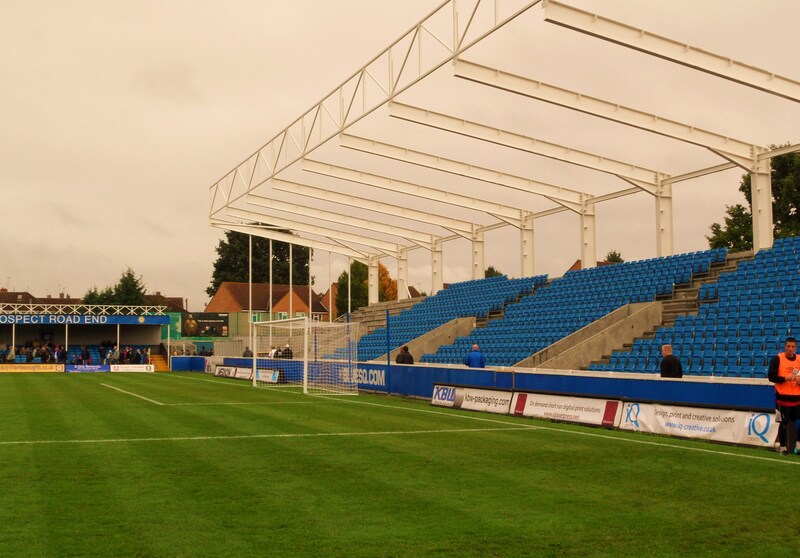 Opposite is another covered stand which runs the length of the pitch, this was previously a covered terrace but was converted to seating during the 2009 close season. This stand does not have an official name, however, many fans refer to it as the SWAN, an acronym which stands for Stand Without A Name . This additional work has brought the amount on seating at the stadium up to 950. The Moor Road End of the ground is terraced with a covering added to the rear section in summer 2008. The terracing was rebuilt during the 08/09 season. The Prospect Road End is currently undergoing redevelopment with a new 1350 seater stand due to be completed shortly. The stand will also feature disabled facilities and contain a concourse underneath with toilets and refreshment facilities. The new stand has been partly funded by a £150,000 grant from the Football Foundation whilst the fans are contributing towards the remaining cost. Inside the stadium are two excellent bars – The Dugout has a couple of dart boards and big screen TV’s whilst the smaller Boro Burger bar does some excellent burgers, would you believe it! How to get to the Rushmoor Stadium Leave the motorway at Junction 4 and take the A331 signed to Farnham. After a few hundred yards exit at the second slip road – signed A325 Farnborough – turn right at the roundabout and cross over the dual carriageway and a small roundabout. Pass the Farnborough Gate shopping centre on your left and at the next roundabout turn left onto the A325. Go over a pelican crossing and at the next set of lights take the right filter into Prospect Avenue. At the end of this road turn right at the roundabout into Cherrywood Road. The ground is half a mile on the right. There is parking for approx. 200 cars at the ground (£3 fee) but you have to be early to bag a space. Street parking is tolerated, but local residents tend to have a sense of humour failure if you obstruct their driveways! Farnborough is served by train stations galour with four stations all close by. Farnborough Main is served by frequent and fast services from London Waterloo – average journey time is 35 minutes and costs £13 each way. Exit from the station approach and turn right onto Union Street i.e. with the railway line on your right. After half a mile turn right at the traffic lights onto Prospect Road, go under the railway bridge and follow this road over two mini roundabouts and a real one (where it becomes Cherrywood Road). The ground is half a mile beyond the third roundabout. The nearest station is actually Frimley although you will need to change at Ascot so it sort of defeats the purpose. Farnborough has a fair number of pubs that are not recommended for various reasons. I would recommend the Prince of Wales by Farnborough North station that has a lovely open fire, some decent guest ales and a few fans who are happy to chat about life in general. Admission Admission for this season will be £10 for Adults and £7 for Concessions. 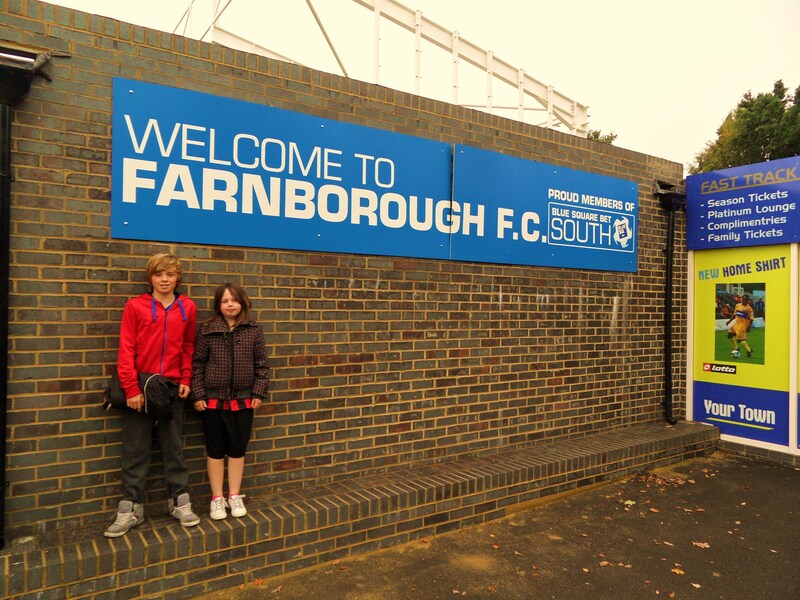 Like Lewes, Farnborough admit under 16’s free of charge. Top marks chaps. Our last visit – October 2010 There is an unwritten law in football that when you play against a former manager you are always going to lose. Last week West Ham finally crushed their voodoo with ‘Appy ‘Arry at the 8th attempt since he was given the boot back in 2001 in the 1-0 win over Spurs. Last season Chelsea’s dreams of a treble were ruined by none other than ex manager “The Special One” then at Inter Milan and who can ever forget the triumphant return to Melchester Rovers by Roy Race when he was at Walford Rovers in 1983. So when Farnborough Town were promoted from the Zamaretto (Southern) League last season all Lewes fans marked the 2nd October 2010 as a certain away defeat. Farnborough manager had legendary status at Lewes after taking them to the Conference South title in 2008. What made this all the more amazing was that on the eve of the final day of the season it was announced King’s contract, along with virtually all of the team’s contracts would not be renewed. The result? Lewes played their first season at the highest non league level with a novice as a manager, and a squad ill prepared for the likes of Oxford United, York City and Burton Albion. And King? Well him and a fair number of those players from that Lewes Championship winning squad ended up in Farnborough. It should be exciting times at the Rushmoor stadium. Farnborough are climbing the leagues again, and there has been some serious investment in the ground. Just twenty four hours after the Lewes game then club were due to host the Nepalese national team. Why you may ask? Well apparently due to the proximity of the Gurka regiment’s home, Farnborough has one of the biggest Nepalese communities in the UK. The original plan was to meet the rest of the Lewes Lunatic Fringe in the Hawley Arms, a pub that has got the lowest rating I have ever seen on the excellent website Beer in the Evening – a massive 1.8 out of 10. However, Danny, Deaks and Dave in the advanced party informed that the pub had shut down and so instead we would have to make do with the Farnborough Dugout bar. A real hardship as it turned out. The TBIR team had been delayed in leaving the office. Around midnight the night before there was a large bang from under the stairs and all of our electrics went off. I slipped on the old handyman outfit from the “bottom draw” and with a promise of a “good tip” from CMF when I fixed the problem I began to check all the fuses. All were in order, our neighbours had power and there was no logical reason for the lack of juice. Wind forward 12 hours and we were still without electricity, awaiting a professional. Being such a wonderful woman CMF said I could go and she would wait in for the “handy man”…sometimes I question her motives. An hour later we parked literally outside the front door of the Rushmoor stadium in Farnborough, took advantage of the excellent family ticket (£10 for me, Lolly and Liam), shook hands with our glorious leaders and found ourselves in the very smart bar in the main stand. Looking around at the plush surroundings you would be hard pressed to think you were in a Conference South ground. So comfortable were the settings that a number of fans simply didn’t move when it was time for the action to start. Part of Farnborough’s ambitious plans is the new Prospect Road End which will be a 1,300 all seater stand, but is already more than a year late and shows little signs of completion any time soon. Quite why the club need such a large structure was lost not only on the Lewes fans, but also the home ones standing at the far end. Lewes’s form coming into the game wasn’t good. Apart from the 2-0 win in the cup last week, they were on a run of six consecutive defeats. And with our David Wheeler out injured the signs didn’t look good, even when Farnborough announced that eBay would be playing for them – hardly fair including one of the world’s biggest online companies in your starting line up. Farnborough FC 1 Lewes 0 – Cherrywood Road – Saturday 2nd October 2010 Whilst these are exciting times for Farnborough, I was actually present at the biggest moment in their history. On 4th January 1992 the club travelled to Upton Park to play West Ham “at home” in the FA Cup and came away with a brilliant 1-1 draw. A few days later they returned for the replay, losing 1-0 to a last gasp Trevor Morley goal. Five divisions separated the clubs on that day. Nearly nineteen years later approximately 21,000 less were in the ground for this game but the atmosphere was almost as good as you get at Upton Park these days. Faced with just one “end”, the Lewes fans took up their position behind the goal with the Farnborough “under fives”. The banter was loud and amusing most of the times – a mutual love for King, a mutual mocking of the unfinished stand opposite. Lewes fans threw in songs about Aldershot, Farnborough for some reason assumed that all Lewes fans came from Brighton and started down the homophobic chanting. One classic comment when one of the yoofs was asked if he drove a pimped up Nova was “no mate, a Corsa”. Classic. You may get the impression that such incidents distracted us from the football – and you would be right. Lewes played Gradwell up front on his own, and with Wormull sitting deep, created very little in a half ruined by a fussy ref who loved to stop play whenever he could. And it was in the result of one of these stoppages that Farnborough took the lead when Ibe (aka eBay) was allowed to turn in the area and poke the ball past the impressive Winterton in the Lewes goal. There was more of the same in the second half, especially when Gradwell was replaced by Dan Beck and the game petered out as the rain began to fall again. I cannot remember Lewes actually having one single chance on goal. Farnborough hit the post towards the end of the game, but in truth the referee caused them more problems, booking players at will. It was left to a debate about what you would put in football’s Room 101 if you were in charge of the game. Coloured boots would be outlawed – Farnborough had all eleven players at one point sporting “trendy boots”, something that would make our friends over at Fancy Dan Boots quiver with excitement. Second up would be cycling shorts – pointless modern day cockpieces and finally Stan Collymore – simple as that although Deaksy’s submission that Linesmen should be made to wear shin pads because men wearing football socks pulled up “is just wrong” gained a snigger from the portly linesman. Full time and a seven consecutive defeat for Lewes was bad, but when the results started to come through Boreham Wood’s surprise win over Dartford meant that the Rooks hit rock bottom of the league – ouch. It’s going to be a long long season. Still at least I returned home to artificial light and television – thank the lord for Kevin the sparky! More photos from the game can be found on our Flickr stream here.